Tim was born in Surrey in 1954. He began painting in his early teens and has spent his life developing his skills	as a picture restorer and as an artist of oil paintings, watercolour paintings, miniatures and mural paintings. He also restores painted panelling and mural paintings. Tim studied picture restoration and conservation under the tutelege of John Brangwyn, conservator of paintings at Hampton Court. Since then Tim has setup his own art restoration service / picture restorer and artists studio in Surrey where he has worked in his own right. 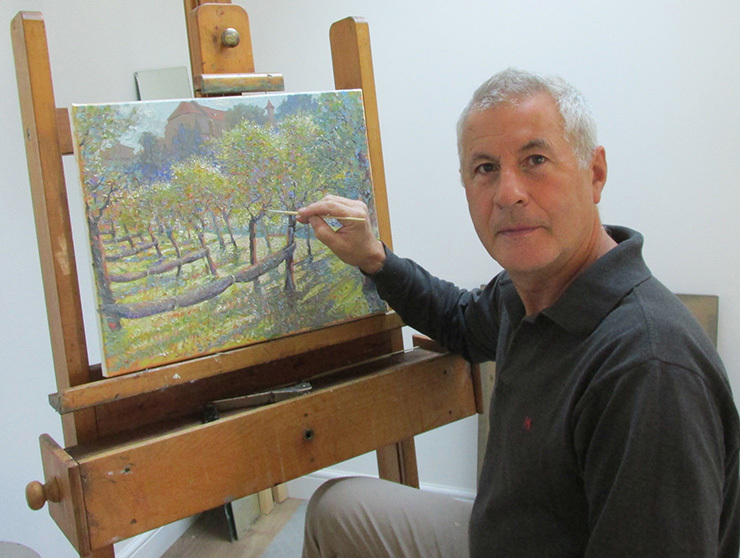 He accepts painting restoration projects throughout the UK and Internationally but mostly in his local area of London and Surrey in his Dorking Studio. Tim has exhibited his own paintings several times at the Royal Academy Summer Exhibition, The Miniature Society, The Marine Society, The Royal Society of Portrait Painters and the Institute of Watercolour Painters. Through the years he has held fourteen one man exhibitions including one in Paris and has won the Pro Art prize for painting at Discerning Eye Exhibition in the Mall Galleries. He has a keen eye for detail and feel in a painting. See Tim's online gallery. Tim specializes in miniature painting, particularly watercolour on vellum which stems from the fine and detailed work he does as a picture restorer. Still life miniatures in the traditional genre are a mark of his work, with the observation of detail in the minute brushstrokes picking	up every nuance of light and colour. He also creates larger watercolours which are exemplified in his Paintings of Venice. Tim will undertake art commissions for country house portraits, including beautifully detailed paintings no bigger than the palm of your hand in a watergilded frame that he designs and makes himself. Recent commissions have included large scale Mural Paintings some being in the Trompe L'Oeil style. Landscape paintings also feature in Tim's work and these have been painted in Watercolour, Oils and more recently, contemporary landscape paintings as abstract forms in acrylics. Working in painting restoration and as an artist has provided Tim with the skills to produce painted film props. He has painted in 15th Century, Victorian, Impressionistic, and many other styles for television and film productions. Tim also undertakes painted antique restoration and the creation of painted period reproductions. More recently he has been experimenting in new mediums creating glass art pictures and also using the old technique of Verre Églomisé. This technique combines Gilding on the back of glass with enamel paints which produces a depth of colour unobtainable in other ways.